He had an idea of the far-right as a perennial outsider, newsworthy only when it seemed on the verge of entering the mainstream. You could imagine a historian of the future trying to analyse the BNP’s growth only from the snapshot-reports about its success in the mainstream press; every report would say that the BNP was growing (and yet it never achieved such a breakthrough as to become significantly larger than it always had been). Such a historian could tell that it was growing not from the content of the reports, but only from their frequency (it was only when this story became weekly or daily news that the BNP was actually in a condition of ascent). 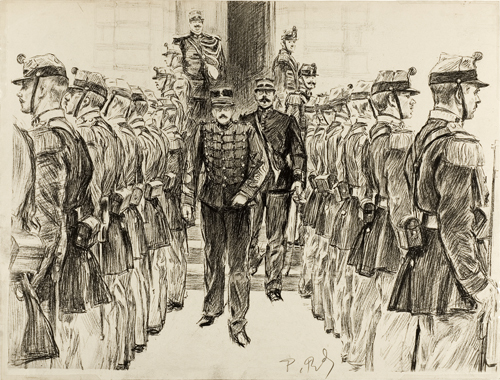 France is a key case because it has both the most successful far-right party of contemporary Europe (the FN) and because it had a vibrant far-right milieu expressed in Boulangism and the Dreyfus affair (see image, above), which has immensely well mined by historians such as Ze’ev Sternhell. It is superficially a strong case of continuity; whereas if you were to start in Britain, a heroic effort would be needed to find in Edwardian politics a neat precursor to, say, Nigel Farage. But the notion of a persistence in French or European politics between 1914 and 2014 is a sociologist’s not a historian’s comparison, which is polite way of saying simply that I distrust it. The people of 100 years ago who seem superficially to be the predecessors of Le Pen (Peguy, Barres, Maurras…) were writers who for the most part supported Catholicism, the return of the monarchy, and the defence of the army. They were, in other words, the militant champions of conservative politics, not the harbringers of an independent politics with a hostile relationship to the existing state. In English terms, they were not Robert Kilroy-Silk or even Douglas Carswell, rather they were noisy followers of Boris Johnson. Second, in Neil Davidson’s chapter of the book, there is a slightly more diffuse and therefore actually more compelling, use of the longue durée focussed on the key question of whether capital needed either the historic or the contemporary far-right. Which seems just about right to me. a heroic effort would be needed to find in Edwardian politics a neat precursor to, say, Nigel Farage. Noel Pemberton-Billing. What do I win? Sternhell is a vicious liar and slanderer – see my forthcoming article in Socialist History.